A Human Hero: This original sculpture is inspired by the 1986 comic book masterpiece "The Dark Knight Returns." This gritty adventure helped to establish the more realistic and complex portrayal of the Dark Knight in modern media. Limited run of 875 Keepsake Ornaments ($25 each). Cylon Centurion: In the classic 1978 TV series "Battlestar Galactica™," Cylon Centurions relentlessly pursue the "ragtag" survivors of the twelve colonies of humanity across the reaches of space with a single goal: destroy all humanoids. This gold-painted variant of last year's popular ornament is Hallmark's first Comic-Con exclusive to feature sound. Limited run of 750 Keepsake Ornaments ($25 each). "We're excited to return to Comic-Con and to reward our passionate fans with exclusive Keepsake Ornaments and first-looks at new products," said Beth Dorr, associate merchandise manager for Keepsake Ornaments. "This year, we're bringing back fan-favorite activities, such as daily pin giveaways, and offering new activities, including autograph sessions with a Hallmark Keepsake Ornament artist." Visitors to Hallmark's booth in the Lucasfilm Pavilion will be able to meet and receive free autographs from Robert Chad, one of the Hallmark artists behind the 4-LOM and Zuckuss Keepsake Ornaments. Attendees also can view many of the new 2012 Keepsake Ornaments, including Edward and Bella's Wedding and The Amazing Spiderman™, as well as get a sneak peek of what's to come in 2013. A series of collectible buttons featuring five Keepsake Ornaments also will be available for fan pick-up. The series features five designs, with a limited quantity of one design given away each day of Comic-Con. Fans not in attendance still can be a part of Hallmark's Comic-Con action. 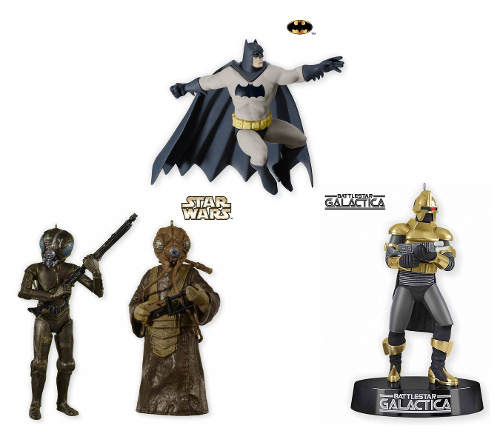 Hallmark will give away one set of Comic-Con-exclusive Keepsake Ornaments on Twitter before the convention begins. Additional product giveaways will be hosted before and during the convention. Follow @HallmarkPR, #ComicCon and #SDCC for more information. Hallmark makes the world a more caring place by helping people express what's in their hearts and spend time together — a privilege few other companies in the world enjoy. Hallmark greeting cards and other products are found in more than 40,000 retail outlets in the U.S., including the network of flagship Hallmark Gold Crown® stores. The brand also reaches people online at Hallmark.com and on television through Hallmark Hall of Fame original movies and cable's top-rated Hallmark Channel. Worldwide, Hallmark offers products in more than 30 languages available in 100 countries. This privately held company is based in Kansas City, Mo., and is led by the third generation of the founding Hall family. Visit http://corporate.hallmark.com for more details.